The home of the University of Virginia's soccer and lacrosse teams is Klöckner Stadium, considered one of the nation's premier college soccer and lacrosse facilities. In its short history, Klöckner has played host to numerous soccer and lacrosse postseason games. The state-of-the-art facility was unveiled on Aug. 30, 1992, when 6,142 sun-drenched fans gathered for a dedication exhibition match between Santa Clara and Virginia. 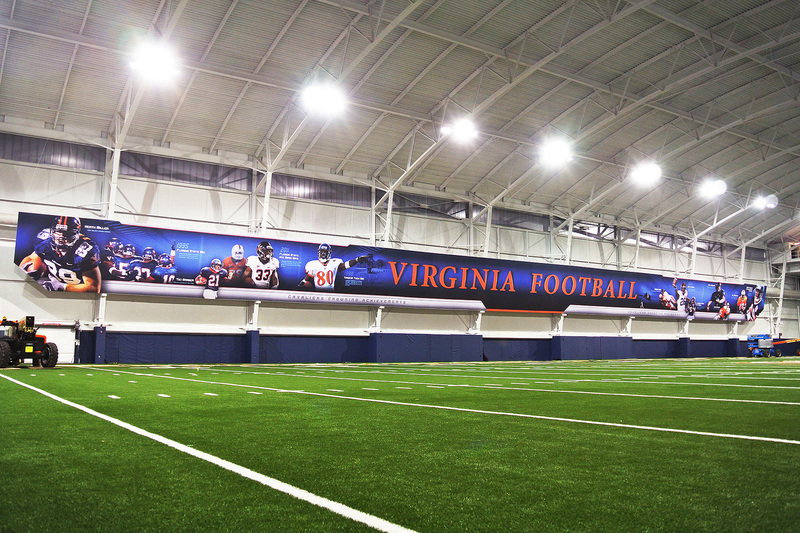 The rematch between the two finalists from the 1991 NCAA championship game was a fitting matchup to officially dedicate a facility where UVa would prove virtually unbeatable in the coming years. In what would become a season-long trait, UVa scored on a rebound when Ben Crawley headed in Damian Silvera's deflected shot in the 62nd minute for the historic first goal at the new field as UVa defeated Santa Clara 1-0 to start its march towards a second consecutive NCAA championship. The men's and women's lacrosse teams play all home games at Köckner Stadium. The field has served as one of the best places to catch the most exciting lacrosse games in ACC history. It also attracts some of the best teams in the country, which makes for an exhilarating spring in Klöckner. Built at a cost of $3.4 million, Klöckner Stadium was made possible through the generosity of the Klöckner Group donating $1.2 million to the construction the stadium. Klöckner, with headquarters in Germany, is an established and well-known industrial conglomerate specializing in steel, machinery, equipment and packaging materials. Its subsidiary, Klöckner-Pentaplast, is one of the nation's leading plastic film manufacturers. Klöckner operates numerous manufacturing plants throughout the United States, including one in Gordonsville, Va., outside Charlottesville. The $1.2 million gift from Klöckner went toward completion of the first phase of the Klöckner Stadium project. The project's first phase included permanent seating in the grandstand for 3,600 (with additional hillside seating for approximately 3,500 people), a regulation-size natural grass field, a full-size practice field adjacent to the stadium, team locker rooms, a press box, an indoor VIP box, scoreboard, concession stands and rest rooms. The second phase of the stadium project, the installation of a lighting system, was completed during the summer of 1995. The Klöckner Group renewed its commitment to the University as the largest donor to this project. The lighting system provides lighting on the playing field as well as on the walkways leading to the stadium from surrounding streets and parking lots. UVa played its first night game at Klöckner Stadium on September 13, 1995, against Virginia Tech as 3,358 fans braved a threatening thunderstorm to attend the historic game. Despite a 30-minute first-half rain delay, many fans remained to cheer the Cavaliers on to a 7-1 victory. In addition to serving as the home of the Cavaliers, Klöckner Stadium allows the University of Virginia to sponsor coaching clinics, state cup and high school championships, conference, regional and national intercollegiate contests and tournaments. It also plays host to United States Soccer Federation events and national team Olympic qualifiers. Klöckner Stadium has also been used as a training site for the D.C. United team of Major League Soccer and as the site for the Spring Game for the UVa football team. In 2004, the facility received a new scoreboard, and in 2006 a new state-of-the-art video display board was added to the scoreboard.